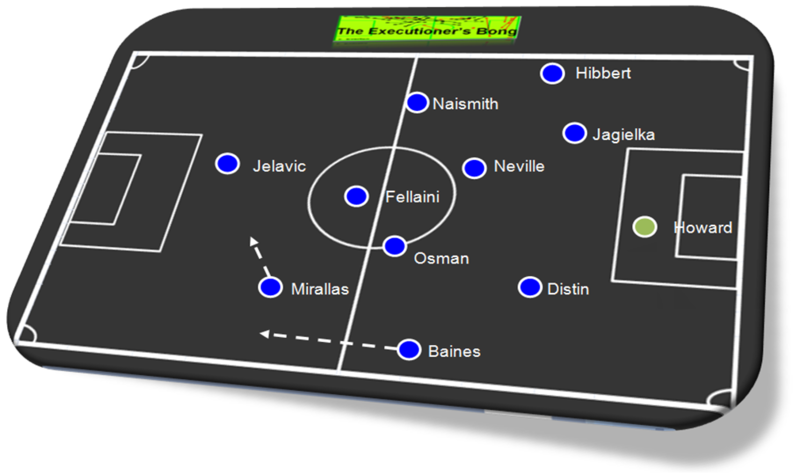 Moyes setup with Mirallas in for Pienaar on the left with Fellaini returning and Naismith coming in on the right. Brenny went with Sterling right, Suso left and Sahin at the attacking tip of a three man midfield triangle. 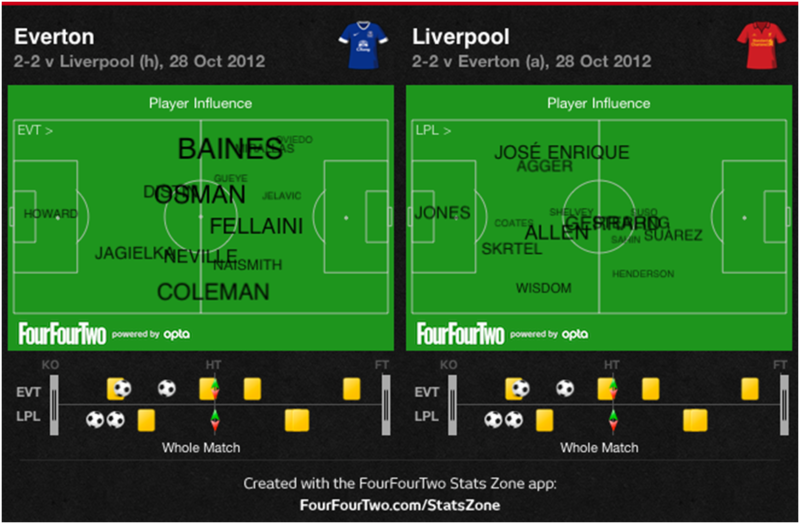 As expected, we went like for like in this midfield zone with Allen and Fellaini the most interesting direct duel. Our approach was as it was vs Swansea last season i.e press high up field, disrupt rhythm, cut off angles for forward passes and build possession in the opposition half, predominantly via Osman / Baines whose 29 combinations was the most of any players on the pitch. As the below average player position / importance visual demonstrates, we played the bulk of the game in Liverpool’s half. Passes wise, we had considerably more of the ball with 66% final third possession with 234 v 108 final third touches leading to us creating 14 chances to Liverpool’s 11. Our opponents were slightly more positive on the ball with 54% of their passes made being forward ones compared to our 51%. Liverpool did make more long passes, unsurprising given the fact they spent most of the game in their own half and were reliant on counter attacks and trying to get the ball forward as quickly as possible to Suarez/Sterling. Defensively we looked shaky again with our high pressing / equally high defensive line combo meaning there was plenty of space in behind as has been exploited in recent weeks by strikers of lesser quality such as Kone vs Wigan. Liverpool’s main attacking strategy was as predicted in our preview with Suarez looking to arrow into pockets of space left by the marauding runs of Baines as shown below. 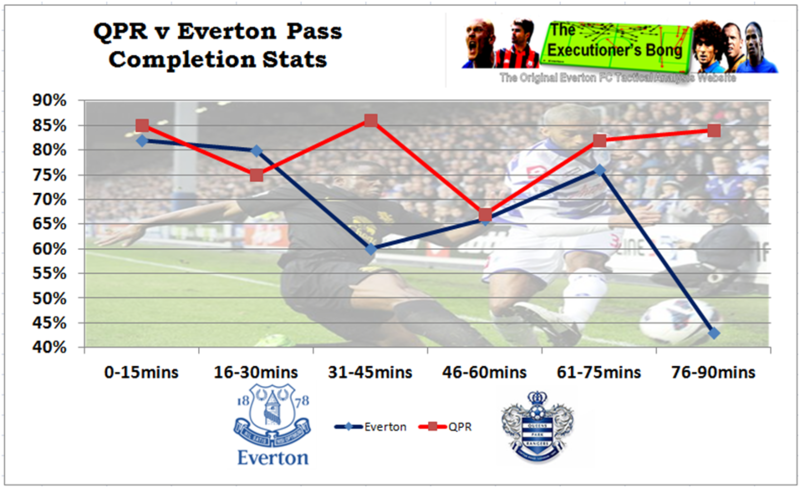 Distin is a great defender but struggles against Suarez more than any other opponent. The Uruguayan is one of the few strikers who can beat him for pace; this combined with his quick feet make him a tricky customer for the big man. Ultimately you can stop this by keeping two narrow banks of four but this reduces your attacking game plan. Mirallas was the player of the first half and led the poor Wisdom a merry dance with his trickery and direct running although in fairness to the hapless Wisdom he was afforded little protection from Sterling in front of him. Liverpool were really struggling in the channels and consequently defending the ball into their box with both our goals following enterprising work down the channels. The Belgian was cynically taken out by Suarez and was replaced by Gueye and our attacking game plan never really looked as incisive from then on. The Senegalese in front of Baines doesn’t work and there’s no chemistry between the pair as both are lefties who prefer to hug the line whereas with Pienaar /Mirallas you have one who will go inside and leave the space for Baines to bomb on. There’s also the nagging doubt that Gueye is basically crud and unlikely to make the grade. 4. Liverpool go 3 at the back…. With the game 2-2 at half time Professor Rodgers made some big personnel and tactical switches as despite being level his side has been on the back foot for the most part. Rodgers went with 3 centre backs, post match citing the direct balls we play into the box as the reason why. Our offensive game wasn’t any different to usual so you wonder why if he knew this he didn’t start out this way. Sterling also went as a forward behind Suarez with the duo’s pace looking to push us back – this also reduced the teenager’s defensive duties mitigating the risk of a probable red card after his first half fouling spree. Sahin was also replaced for the greater physicality of Shelvey. The move basically meant we could still overload 2 v 1 on the flanks but Liverpool now had more coverage in the centre to handle fellaini – who looked half fit – and Jelavic when the ball went into their box. Our extra men on the touchlines meant we dominated the ball – surprising as we expected the opposite to be the case with Rodgers style. Did this tactical switch actually make much difference? Liverpool’s passing completion actually went down in the second half from 79% to 75% and the additional height didn’t translate into winning more headers. Obviously the fact they had more bodies in this area meant they were better equipped to hoover up second balls. The switch didn’t really impact on our own passing game as we were steady at 78% pass completion in both halves. This was an interesting tussle between two managers who like a tactical joust. Territorially we bossed the game and created more chances although Liverpool always looked dangerous on the counter attack. The negative slant is that we have now drawn 3 games on the spin against sides in the bottom half of the table although in each game we have showed great resolve to come back from losing situations to take something. Overall though it was an exciting game with plenty of incident including bad decisions for both sides in what is always a spicy fixture. Very likely is PSV Eindhoven – 14 of their last 15 in Eredivisie have seen over 2.5 goals scored whilst Manchester United’s last 7 games in the Premier League have hit this marker too. In Serie A there have been over 2.5 goals scored in 15 of Roma’s last 18 games whilst 10 of Espanyol’s last 12 home games in La Liga have polled the same figure. Finally, in Germany 11 of serial scorers Werder Bremens last 13 games in the Bundesliga have witnessed over 2.5 goals. I’d expect them to have more of the ball than us but ultimately this means little; last season against Swansea for example, we won both games comfortably without conceding despite the Swans having 60% plus possession. Both sides have similar type setups in 4-2-3-1 with attacking width for both sides coming from left backs (Baines & Johnson). In defence, Skrtel and Agger will hold a high line with Johnson /Sterling the more offensive left flank with the right side Widsom / Suso likely to be more defensive given our attacking emphasis on the left. As the only striker, Suarez is obviously the big threat. Aside from the colossal baggage he brings the forward can obviously do damage. As he did at Wembley, he’ll look to arrow into the pockets of space Baines vacates when he marauds forward so Distin will need to be on guard. Moyes has been considerably more proactive this season than in recent campaigns given the players he now has at his disposal but he loves a spoiling tactic. It’d be surprising if he didn’t look to use a similar blueprint that he used against Swansea last season i.e. stop Liverpool playing at the source (Reina/Jones) and press to disrupt rhythm and cut off the ball from Allen to Gerrard, the most used combination as shown from the above player importance visual. I’d expect us to line-up like this…..
We are sweating on the fitness of Fellaini and Gibson and it’s probably a long shot that both will make it with Fellaini more likely and if were being honest he is the more important player. Pienaar’s suspension will mean a reshuffle on the flanks; expect Mirallas left and Naismith right with Coleman’s status as a liability meaning that Hibbert will more than likely return after playing in the u21 game vs Arsenal on Monday. It’s the midfield area which poses the biggest risk to us securing a positive result. 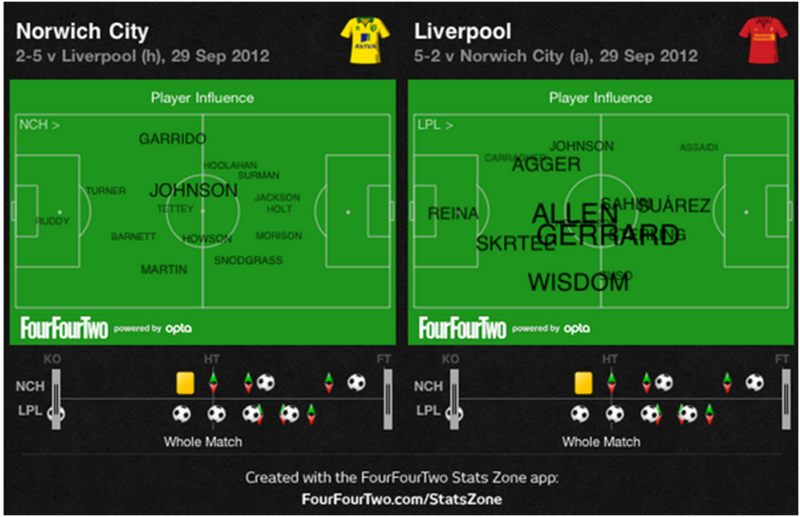 The Reds play a 2 + 1 midfield triangle with Allen/Gerrard as the base and Sahin further forward. 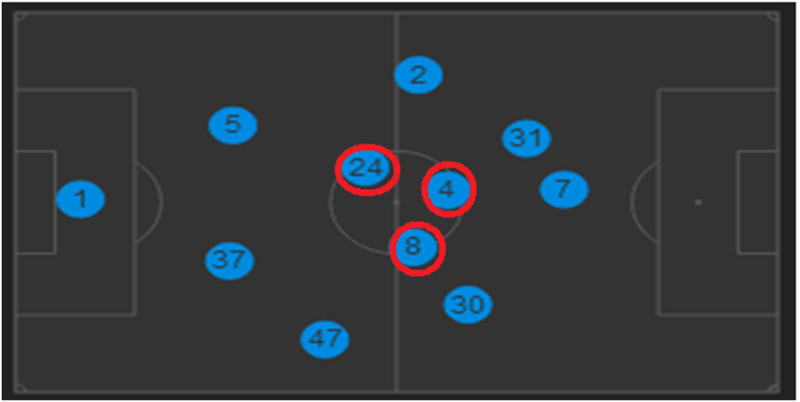 The below average position visual from last week’s win against Reading demonstrates this with the trio circled…. With Fellaini nowadays deployed as more of a forward we often go with just 2 men in midfield. Against Liverpool’s 3 there is a risk we could be swamped. Therefore its crucial Fellaini does a job for the team and drops in on Allen when the ‘Welsh Xavi’ gets on the ball. It’s likely this area will become congested with both sides playing high lines and compressing play in the centre so the side who uses the space on the flanks better will be the likely winner. Whilst we have scored the most headed goals in the top flight, Liverpool are very good at defending set plays – they have conceded the fewest headed chances in the league. However, their defensive weakness lies in the fact they try to play out from the back without necessarily aving the players to do it. Stoke showed recently that by pushing your wide men up and pressing from the top -starting with Reina- that you can disrupt rhythm and force mistakes. Prior to the last round of games they had made the most errors leading to goals in top flight (5) with Skrtel – a player ill equipped to implement total football – making the most of any player in the top flight. Form wise, in 2012 we’ve picked up double the points of our visitors; our form is top four whilst theirs is bottom six. Still, in this period we’ve lost two in two against them. Psychological issues have been suggested by some as the root cause and in the past Moyes has been happy to depict us as the plucky under-privileged neighbour which is perhaps a factor in us accepting this role as being inferior. The Scot’s record against the Reds is beyond abysmal after all with 3 wins and 7 defeats from the 10 League Derbies at Goodison. If we look at the home games in isolation, disciplinary issues have perhaps played more a part than any mental block; out of the 10 games we have received 8 red cards and crucially the 3 wins we have registered have come in the games we have not had anyone sent off. As a caveat, Liverpool’s 1-11 has invariably been of greater quality than ours in Moyes time at the club. Now however, 1-11 we have better players in most positions than the Reds and any inferiority complex doesn’t correlate with the current situation at the respective clubs. Keeping our discipline combined with a strong mental outlook and belief to change this perception as plucky up-starts will see us kick on and enforce ourselves on the derby in a way we haven’t done in the past, notably at Wembley last season. Paddy Power are offering 13/8 on a Blue victory with Liverpool best priced at 17/10. The draw is offered at 9/4. Moyes four wins vs Liverpool in all competitions have all come without conceding, so if they score first were pretty much goosed as whenever that’s happened previously under Moyes we’ve lost. As a guide, in the last four derbies at Goodison exactly 2 goals have been scored although given his role as chief dead ball ‘technician’ the Baines goal/Everton win-cast double at 17/2 looks the best bet from a Blue perspective with the card’s market also worth a blimp. 1. 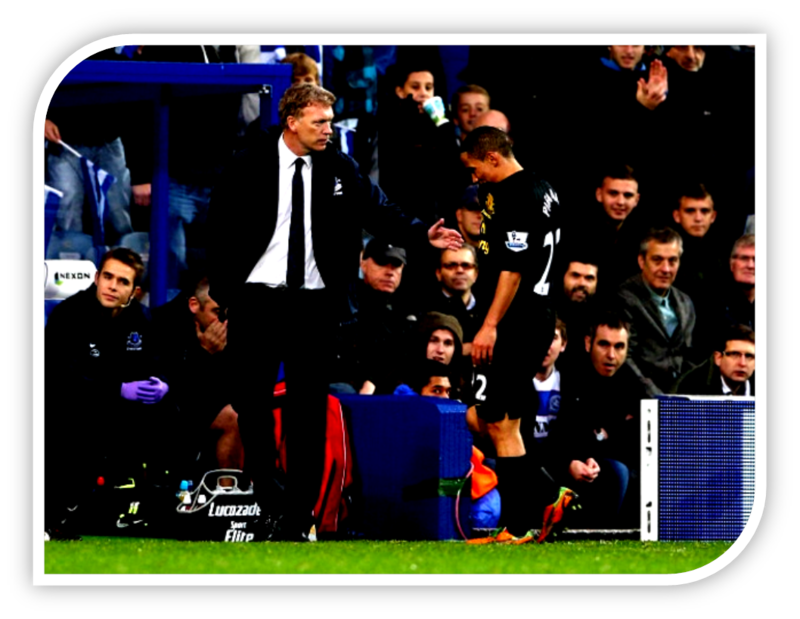 Moyes Tactics – Selection wise, Moyes tinkered (un-necessarily??) and went with Pienaar central and Mirallas left side with Anichebe playing on the right flank in front of Coleman in something resembling 4-2-3-1. After 20 minutes the selection was reversed with Pienaar / Mirallas swopping. 2. Baines Man Marked – QPR deployed the athletic J.S. Park in pretty much a man marking role on Baines – the QPR man had the fewest touches of any home player in the first 45mins with his role basically to track Baines up and down the flank. In the second half with Baines given a more defensive brief at 10 v 11 Park was able to get on the ball more and impose himself offensively. 3. Neville Nightmare – We made the worst possible start with Neville losing a 50-50 with one time Moyes target Junior Hoilett running the length of the pitch to score somewhat fortuitously after a deflection. Perhaps Hoilett should have been tactically fouled before he got into our half. 4. 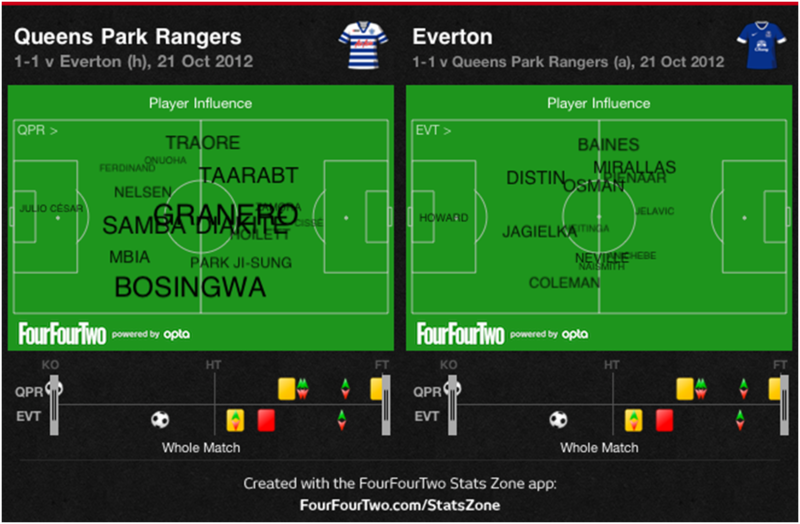 Square pegs, round holes – Anichebe attacking right side didn’t work. Taraabt was cutting in from this flank with Anichebe not supporting Coleman. This meant Neville was increasingly coming to the flank to support leaving a big hole in the centre of midfield with Osman often left 1 v 2 on Diakite and Granero (who ran the midfield). The player touch / importance visual below shows this. Fellaini was a big miss here as usually he can drop in and support when we are under the cosh. 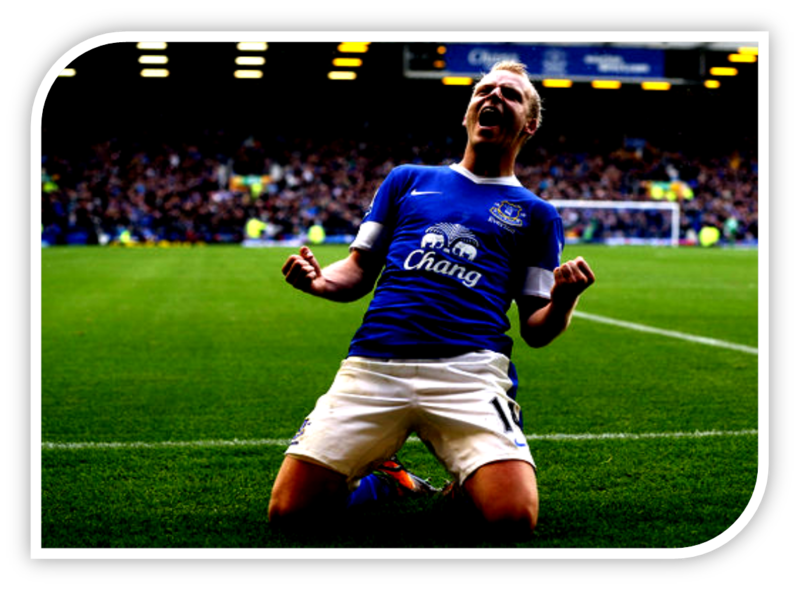 When Naismith came on he did well in probably his best outing in a blue shirt so far. 5. QPR Aerial Weakness – As noted in the preview, QPR can’t defend the aerial ball into their box. Whilst we never got our act together on the deck we looked most threatening aerially with Distin’s goal and Jagielka’s header that came back of the bar our best chances. 7. Forward Passing – Despite having less of the ball we created as much as our hosts with 13 chances each. As the below shows we were a bit more progressive than our hosts with a higher % of forward passes although we made a higher proportion of backward passes. The absence of Fellaini was also felt in the final third; for the first game this season our opponent had more final third touches than we did with the ‘out-ball’ to Fellani’s chest to get bodies up the pitch a big miss throughout. 8. Pienaar Sending Off – Pienaar’s dismissal was a crass decision and although we looked to counter when we could – notably through Mirallas who played well – it ended our hopes of kicking on and going for the win. It also leaves us light for the next game. Oviedo could come in perhaps but Mirallas will probably be the most likely option. 9. 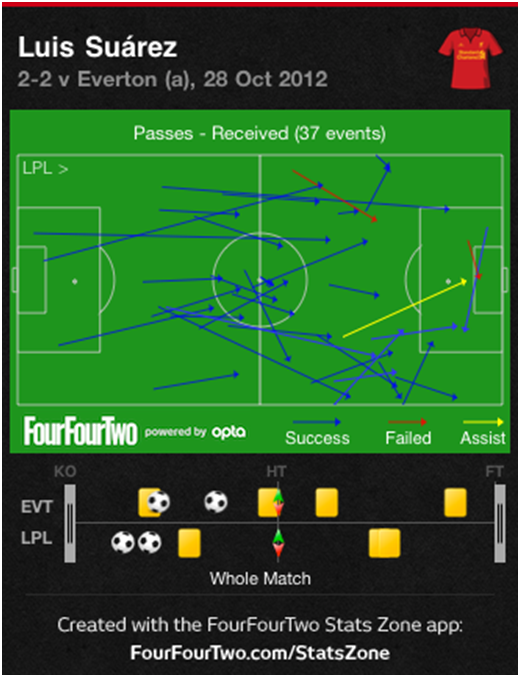 The Jag – Phil Jagielka was comfortably our top performer. He stopped 3 major scoring chances and also won the free kick which led to our equaliser. The final 30 minutes was probably the best / most rigid we have looked all season at the back. 10. Final Verdict – Overall a point was a decent outcome given the red card and our general passing not being up to scratch. The worry is that we have a very decent first eleven but with a few injuries to key players we become more workmanlike lacking the swagger previously shown this season. 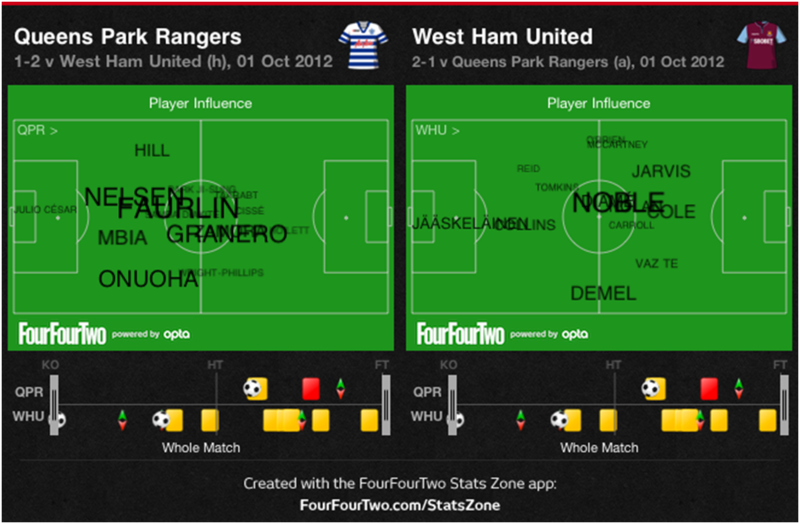 QPR are a basic side but passed the ball better than us even at 11-11. After the unwelcome international break comes a trip to Loftus Road to meet familiar foe Mark Hughes who is currently presiding over his latest ‘project’ at basement club QPR. Since taking office, Hughes recruitment strategy has been scatter gun bordering on an adolescent’s maiden voyage on Championship Manager. He’s recruited 20+ players and selected 23 players already this season (5 more than us) and has chopped and changed personnel and tactics – a sign he is far from clear on his preferred setup. Best of the rest – Home & Abroad…. In the Prem, there have been over 2.5 goals scored in Fulham’s last 7 games in the Premier League and in Manchester United’s last 6 games. Over in La Liga there have been over 2.5 goals scored in 14 of Rayo Vallecano’s last 15 away games . In the Bundesliga there have been over 2.5 goals scored in 10 of Werder Bremen’s last 12 games whilst Benfica’s last 7 games in Liga Sagres have featured 2.5 goals plus. Finally, there have been over 2.5 goals scored in Bastia’s last 8 games in Ligue 1. There is a clear weakness in the full back zones and defending the ball into their box. At the back they’ve conceded the 3rd most chances inside the box and only kamikaze Southampton have conceded more headed chances than our hosts this weekend. They’ve also made the 4th most errors (3) leading to goals with Anton Ferdinand always obliging for needy forwards. Given that we’ve scored more headed goals than any side in the top flight, it’s an area we could expose. In the last home game against West Ham, Hughes played 4-4-2 with full backs not crossing half way as the below player position / importance visual demonstrates. The West Ham game showed they are susceptible to defending quick transitions in wide areas with their wide midfielders not tracking back to help out full backs. 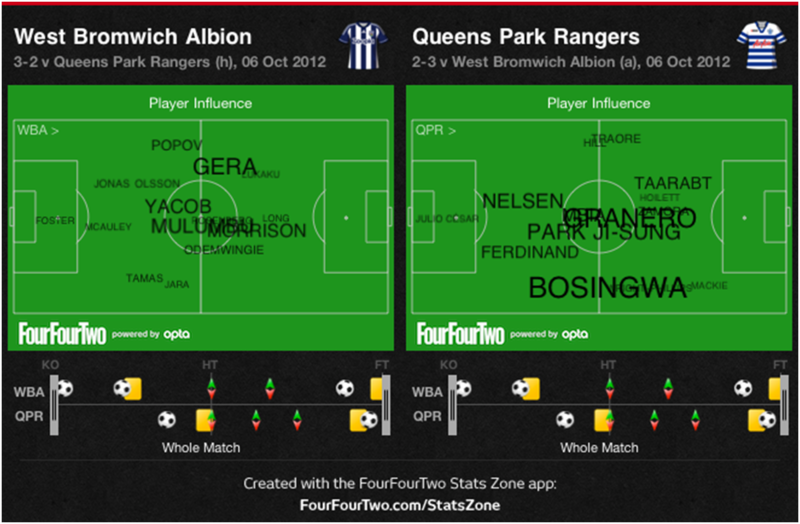 In contrast, against WBA Hughes went 4-2-3-1 with fullbacks playing high up. As the visual below shows everything went through Bosingwa with him and Park making the most combinations (30) in the game. Whilst the Portuguese is good going forward he’s poor defensively. If selected ahead of Onouha on Sunday our left side could do some serious damage. At left back, Fabio, Bosingwa, Traore and Clint Hill have all done a stint in recent weeks. None have impressed with Rangers defence leakier than a disgruntled coalition minister. In short, there’s no cohesion and Mirallas should get plenty of joy. Their 61 chances created is the 4th fewest in the top flight. Against Allardyce’s mob, Taarabt came on and scored, and also found the net last time out against WBA. Granero has also warmed up to his new surroundings with a goal and assist in his last two outings. They are technically excellent players with quick feet who can dribble and win free kicks in and around the box whilst Zamora is a master at buying cheap fouls. As a consequence, they are the most fouled team in the top flight with 149 free kicks won. The most recent visitor’s to Eddie Hitler’s spiritual home received a whopping 8 bookings with 12 cards in total during the game. With a weakness at the back, going forward is perhaps their best option of getting a positive result so I wouldn’t expect them to sit back which could be a good thing given the way other opponents have setup against us such as Villa and Swansea during our successful road trips this campaign. In Granero they have a player who would walk into most sides in the top flight. He’s sublime on the ball and will graft too. Expect him to play alongside Stephane Mbia in the midfield slots. Further forward, Shaun Wright Phillips will play right, Park probably central and Taarabt on the left with Zamora in the lone striker role. For us, it remains to be seen if Fellaini makes it, or Darron Gibson for that matter. Without both we look a bit short in the centre. Naismith off Jela, Mirallas right, Ossie /Neville centre would seem the most likely selection with Distin restored at CB for Heitinga. Everton are favourites for the clash at 5/4 with QPR 23/10 and the draw priced at 23/10 with Paddy Power. 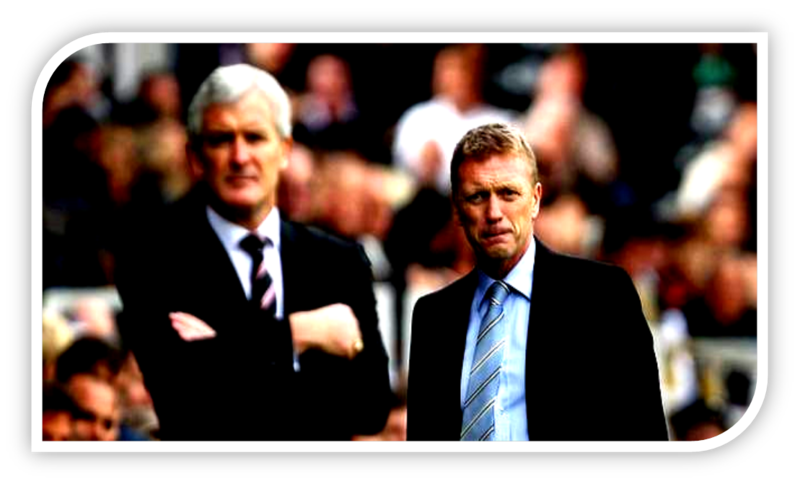 Moyes has a very decent record against Mark Hughes down the years. 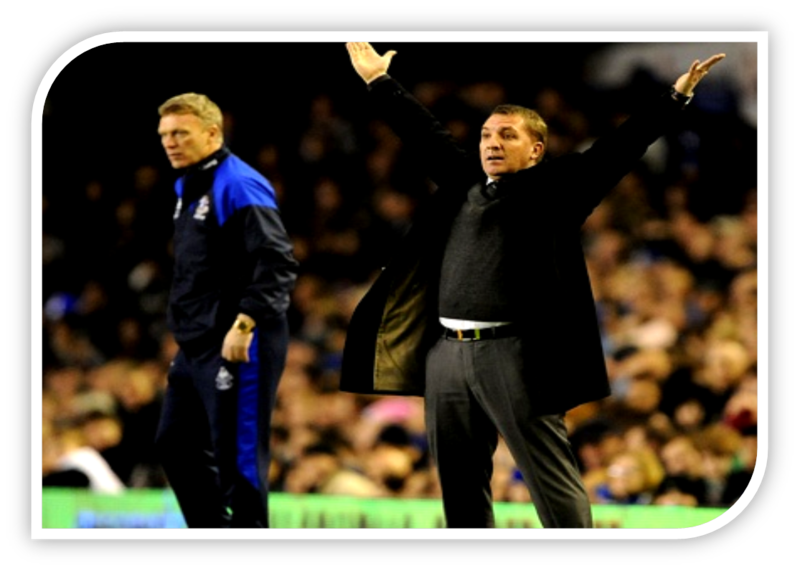 The duo have gone head to head in 13 league games, with 6 Moyes wins, 5 draws and 2 losses. The games have always been cagey affairs characterised by low goals output; 11 of the 13 fixtures have ended under 2.5 goals. With the way Everton have been playing coupled with QPR’s wretched defending I doubt this one will be a low scorer as 71% of the games the two have played this season have been over 2.5 goals and this bet is priced at 5/6 with Paddy Power. 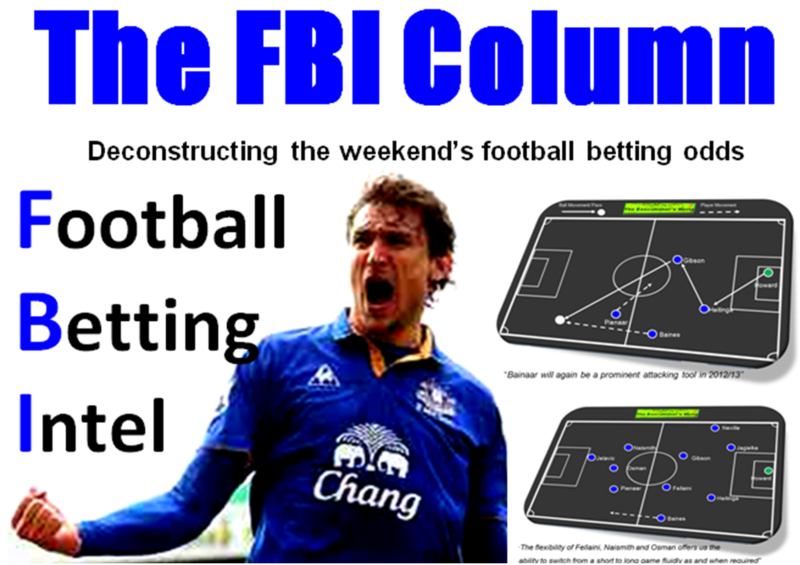 Given his predatory instincts and with Fellaini potentially out, you can get 13/5 Jelavic scores / Everton win double. The over 5 cards market could be the best option though given the above. You can view all Paddy Power’s odds on the weekend football by visiting their football zone here.